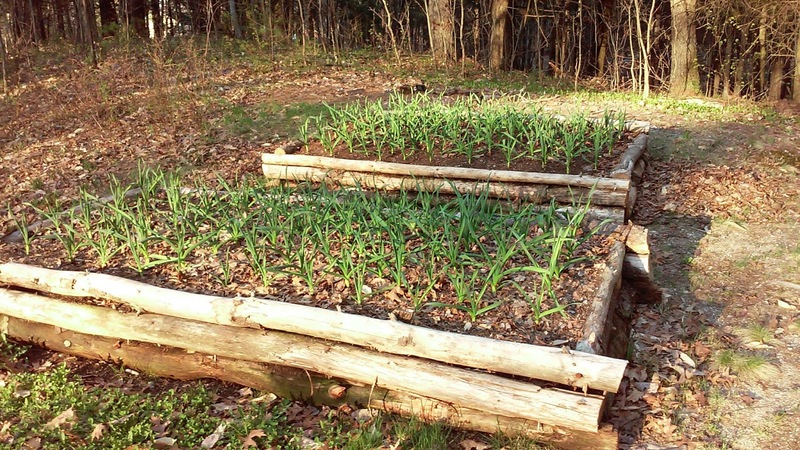 Localrootz Project: Sprung projects and sprouting beds. Sprung projects and sprouting beds. 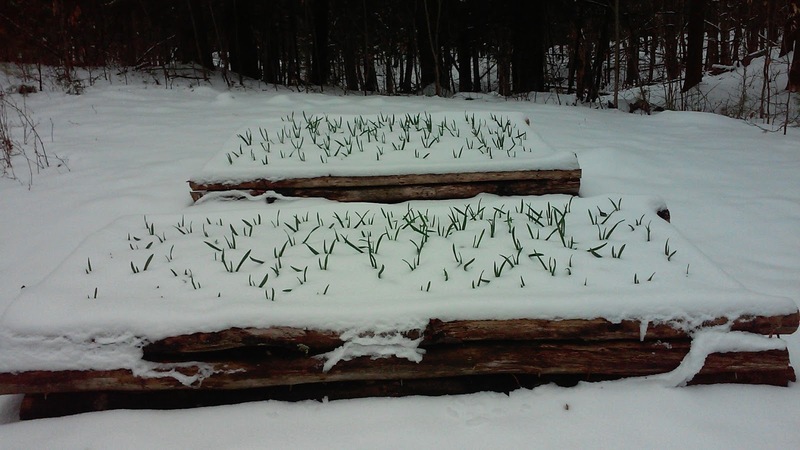 So it would not be spring in Maine without an abrupt weather event to humble us early garden go getters. 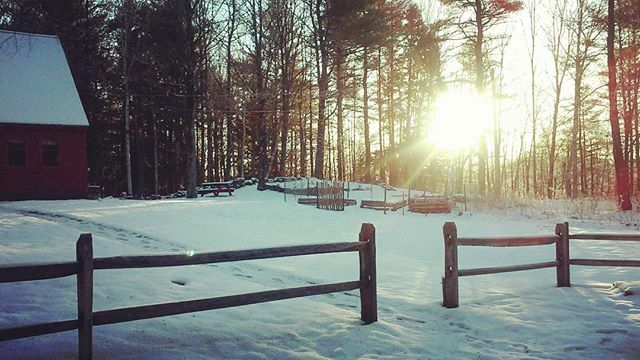 This year it was a sunny 62˙ day followed by a 26˙morning with a blanket of 2 or so inches of snow ! 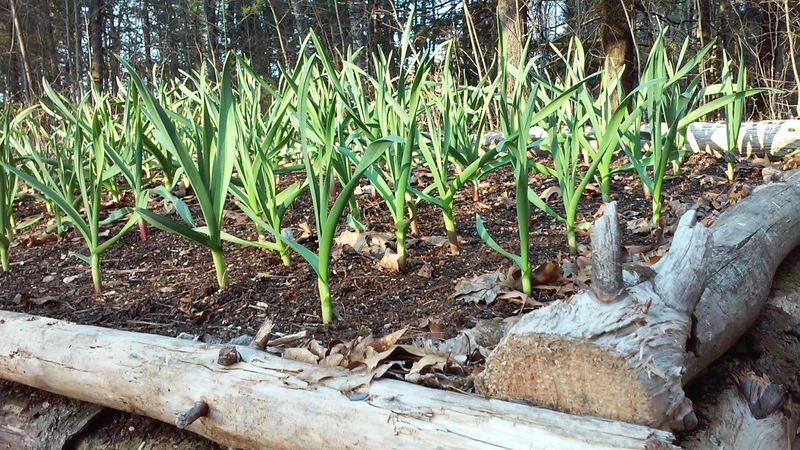 The garlic looked a little confused but I knew it was tough enough to handle natures odd method of watering. About two weeks later, we are really sizing up nicely ! A groundhogs view... I did find what appeared to be some deer nibbles on a couple of the outer stalks of garlic, but it appears the information that deer and most garden munching animals do not like garlic is true because the culprit has yet to take another bite since the original test nibbles ! Time will tell. An eye catching birch tree being overtaken by a good case of birch brackett fungus that I stumbled upon during a landscape assessment session. 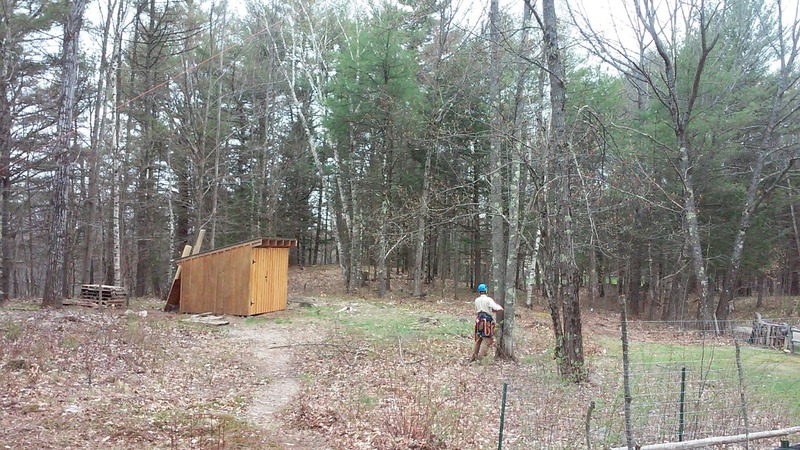 With Spring now in full swing and Summer creeping up it was time to tackle the long list of projects. 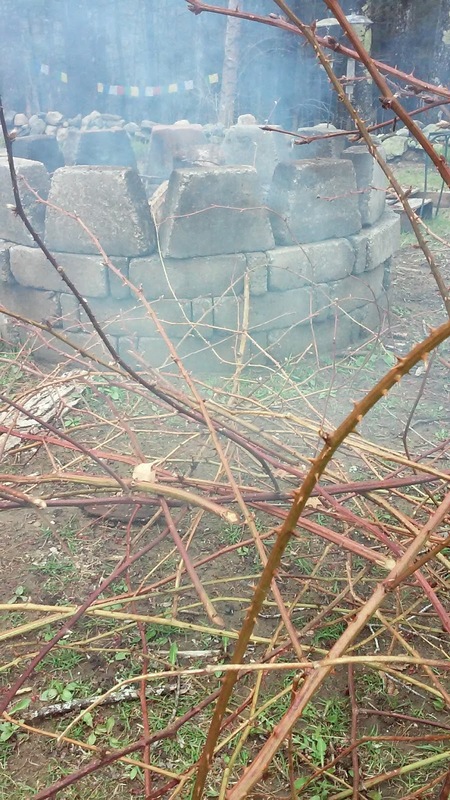 First on the agenda was clearing a large portion of the overwhelming brambles that have overtaken the area between our raised bed gardens and the shed. Its a prick of a job, that required some leather gloves and a little fire to burn the cane trimmings. I did some research and apparently well pruned canes produce far superior fruit in a greater abundance. From my observations they have not been pruned in many years and have spread rapidly. I decided to spend a day or two pruning the majority of the runners and to leave the largest and healthiest canes that are growing along the edge of our lawn and the soon to be orchard section of the homestead. The idea is that over the next few years of pruning and training the canes, I hope to create a living fence line with the spiny thorns that will deter some animals from waltzing over into the orchard and the idea of a few buckets of blackberries will never be a disappointment either. While I was busy pruning away at the canes, another project was also underway. This project had a couple of steps the first being my job. 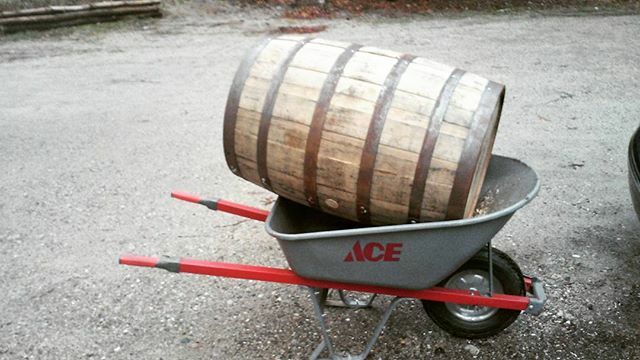 Acquire a barrel with some nice aesthetics. 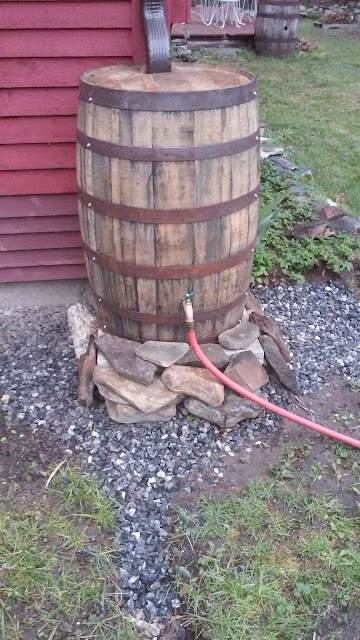 I chose this old wine barrel from a local source and with a few simple tools I converted this barrel into a rain barrel. Part two of the rain barrel project required some outsourcing. After getting a few estimates we chose a reputable company called the Gutter People to install some aluminum gutters with the idea of keeping water away from our foundation. 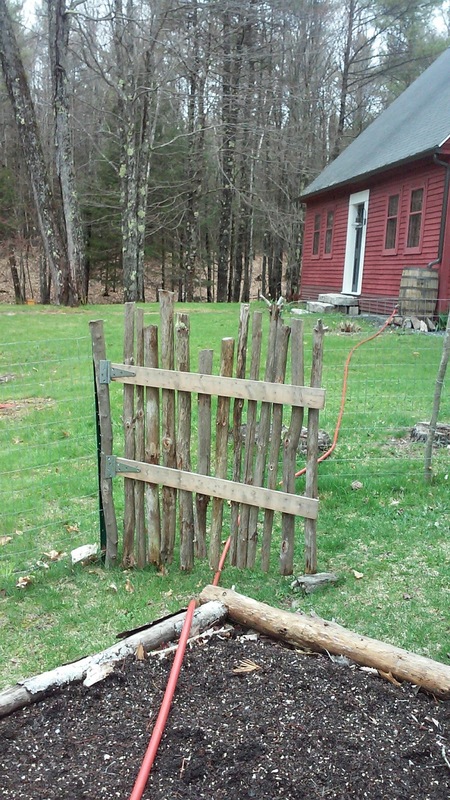 The added bonus of the project was the addition of a rain barrel system for the homesteads watering needs. After grading the front portion of the house and laying a couple feet of weedblocker down then covering with a few hundred pounds of drainage rock the initial part of the project is finished. The barrel works great to water the garden... initially Im just using a hose to troubleshoot the flow of water from the barrel. Eventually I plan on laying an underground polytube to move the water from the barrel to the raised beds, but for now Im happy with the results and the use of a hose will help me fine tune the correct path for the upcoming underground irrigation system. All the pressure is directly from gravity, here you can see a nice stream of clean rainwater flowing from the barrel. 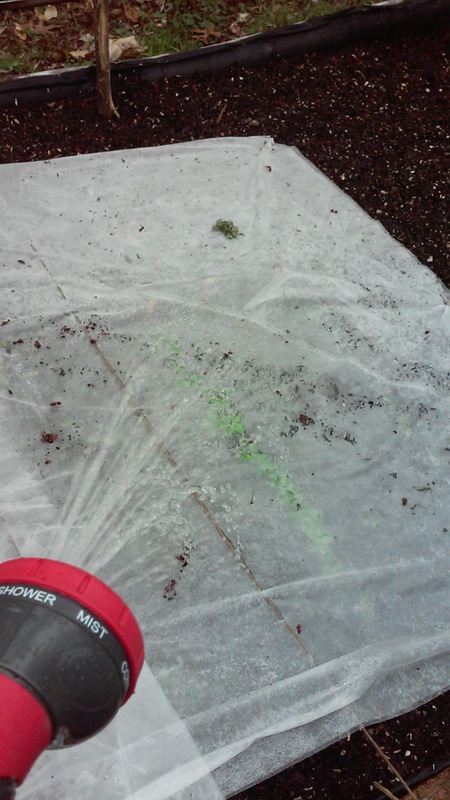 I was surprised that I was even able to get a bit of hand watering done using my garden sprayer, but honestly the best scenario is going to be utilizing a soaker hose. I plan on moving forward with the underground system in the next couple weeks and will update the process better when all the pieces fall into place ! 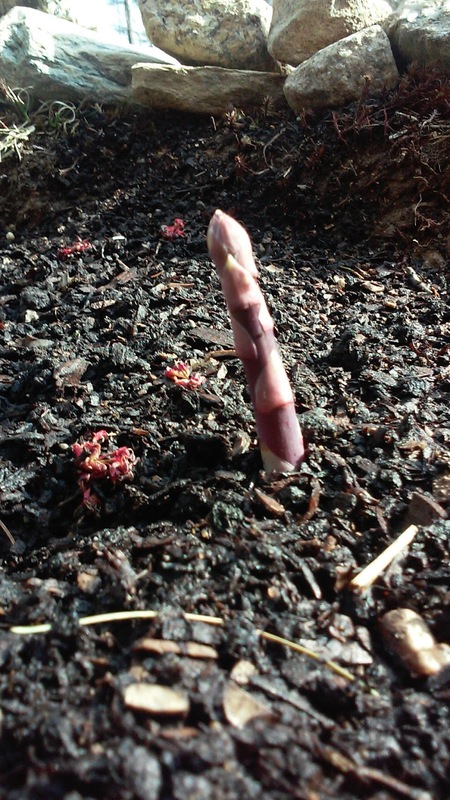 Another growth update, the purple passion asparagus bed that was planted 3-4 weeks ago is popping up with asparagus spears at a rapid pace. This year it is best to just let the spears fern out and establish a strong root system. Its tough leaving it alone but the idea of having a well established asparagus bed for years and years to come helps quell the urge ! Plenty of peas are reaching for the warm afternoon sun... with 77 pea plants we should have plenty of shell peas and sugar snaps for the fourth of july ! 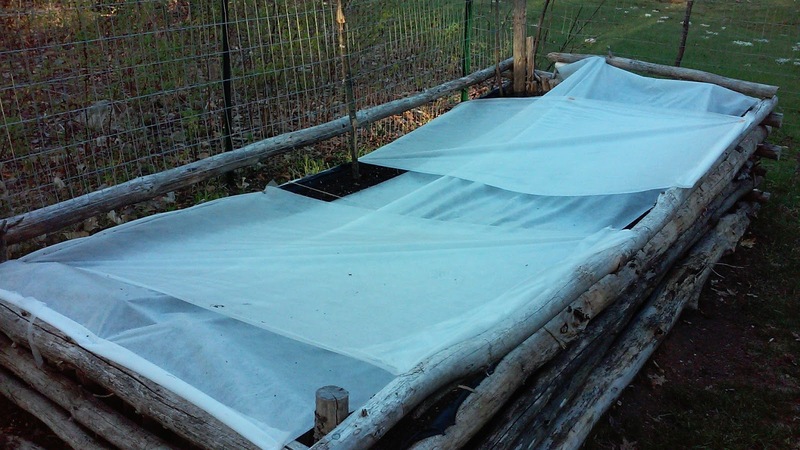 With the evening temps still lingering in the mid 30˙s Ive been keeping a couple layers of row cover over the beds to help them along as temperature warm and the plants size up. 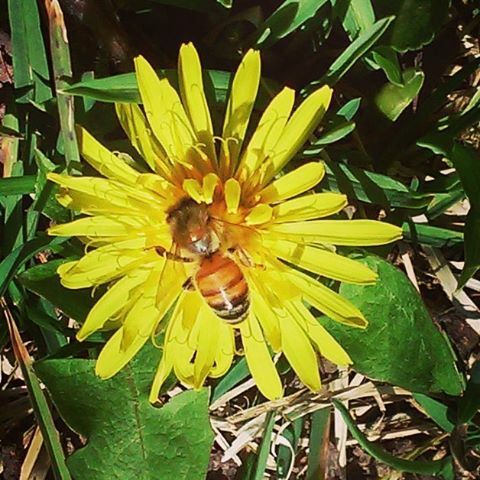 The bees are doing well and its been great to see them soaking up the local pollen around the homestead. Pictured above is a bit of excess comb that was built up around the feeder after a stretch of rainy weather along with the empty queen cage. The queen has been laying eggs and the workers have been busy drawing new comb and capping the brood to establish a full fledge colony. Ive been doing a weekly inspection and am always amazed at just how much work these little guys can accomplish. Stay tuned for a thoroughly documented hive inspection as the temperature warm up and the bees get more comfortable with me poking around. 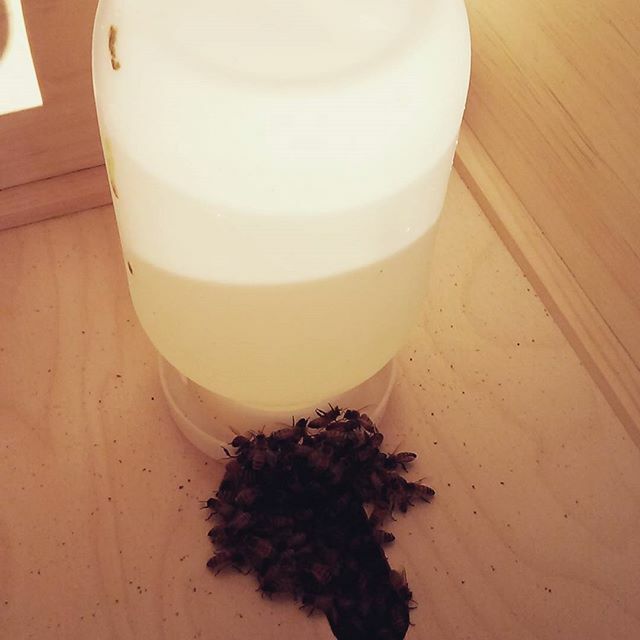 Here is a shot of the hive sipping some sugar water solution on a rainy cool morning. The sugar water provides a nice food source for the colony while they get themselves established. As the landscape blossoms and pollen becomes more abundant I will be removing the food source and letting them rely on their own foraging skills to keep the hive well fed. Another new project that I started last weekend after attending a workshop up the road in Norway at the Center for Ecology-Based Economy or CEBE is a shittake log. 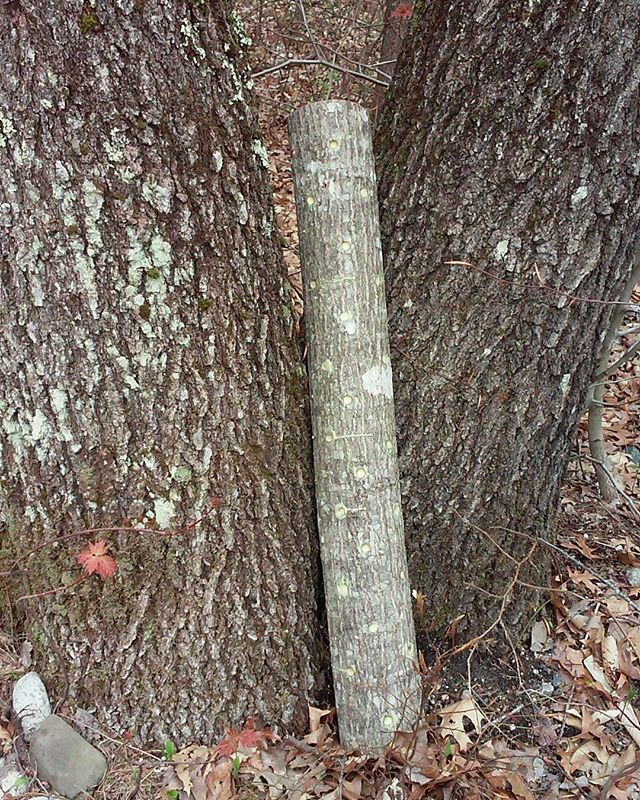 The class was specifically about how to inoculate logs with mushroom spores. Above you'll see my take home example of a shittake log. 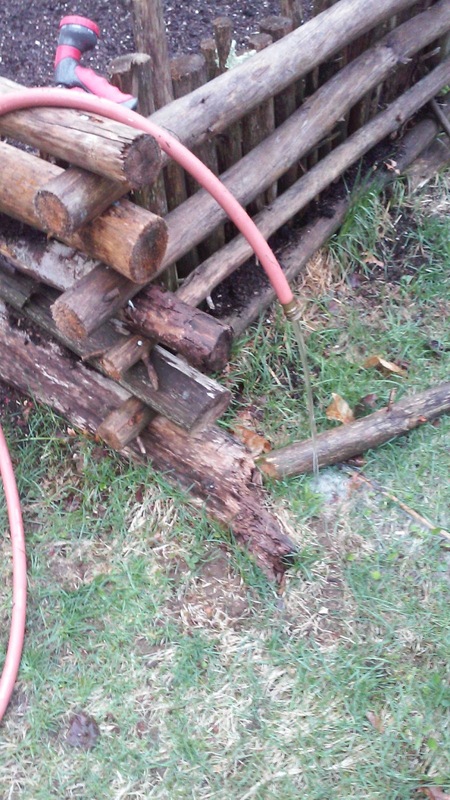 The basic principal is you drill multiple holes in a "host" log. Shittakes grow best on oak. Inside the holes you force a sawdust mixture of shittake spawn into the freshly fallen oak log. 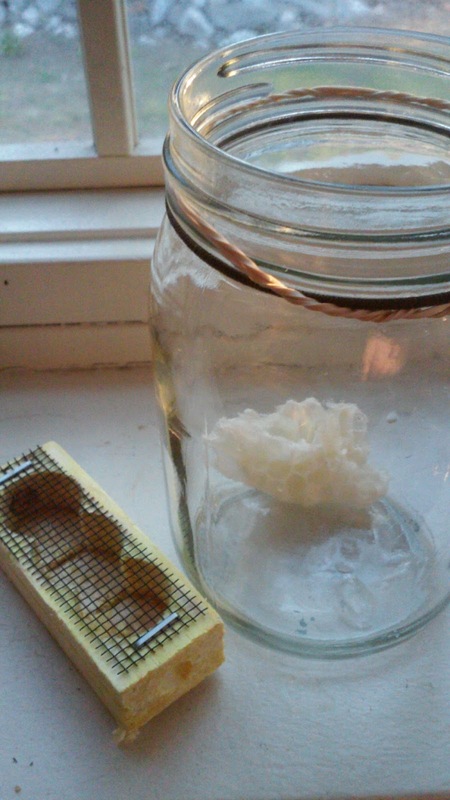 After inoculating all the holes you simply cover the inoculated holes with beeswax and wait. A typical shittake log can take up to a year to fruit but once you see mushrooms you can expect a good supply for up to six years ! I have always been intrigued by the world of fungus and this class stoked that inner flame. 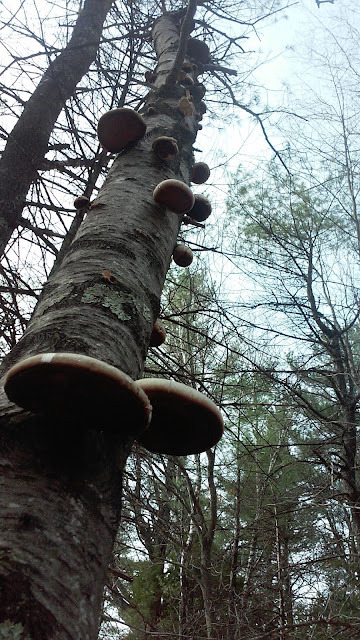 With the abundance of mushrooms that pop up around the homestead I foresee much more fungus related projects in my future including a hefty dose of research and classes on foraging ! In fact immediately following the workshop I met up with a friend of mine who is also an arborist and we dropped a few maples. The reason behind dropping them were many. One reason was to open up some sun space to create a small area for fruit trees and also to free up more growing space for the soon to be tomato beds. If the tomato beds do well in their new location this year, then I will be constructing a greenhouse in that location next year... at least that is the plan for now ! 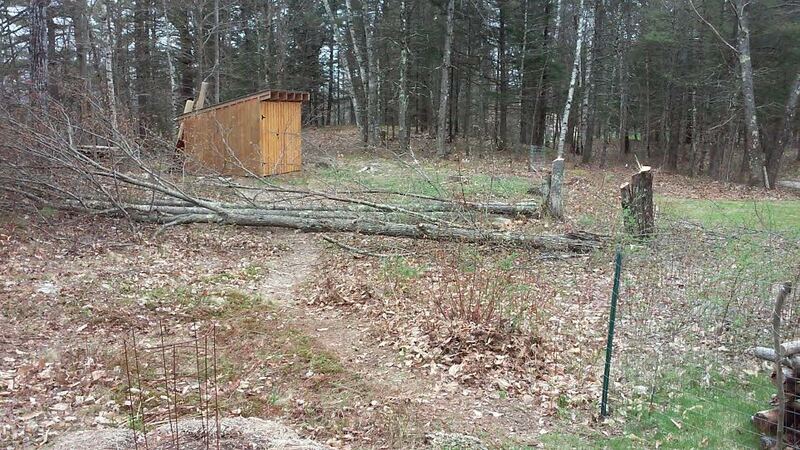 The other reason was simply to restock the firewood supply for next winter... and with my new found knowledge of mushroom inoculation I wouldn't be surprised if I found myself acquiring a small batch of oyster mushroom spawn and inoculating another round of maple logs from these recently dropped trees ! More on this project in coming weeks. 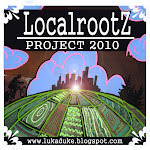 So thats whats been happening over at the Localrootz Homestead ! Im anticipating a very productive weekend coming up and will update you as I get more accomplished.